Hear from one of our happy patients: Savannah! Speaker 1: Hi my name is Savannah and I'm a happy patient of Dr. Kirk Moore. I was actually really satisfied with what I had done with my breast augmentation and oh gosh, I did a lot of extensive research. I wanted to know anything that could go wrong, how long it takes for them to look normal, the type of incisions, where the incisions were, the amount of pain, if there's medication, stretches, pre-stretches, before surgery, after surgery. I was looking at different doctors, different implants, like different textures, everything. I looked up everything. I really looked at Dr. Kirk Moore and his you know treatment to actually getting better was so much easier and he made it, even on the site, it made the comparisons between what he does and what others do. And they, when I actually came in, they told me he is special for this, and that's it. He's not what they would say is a cosmetic surgeon or a plastic surgeon that is a dentist and just decides that they want to do plastic surgery. This is what he does and that's it. So that like made me decide, yeah, he knows exactly what he's doing, and that's really what I want so it worked out that way. Normal things, it took me maybe I want to say like two, three days to actually do some really like, well, not even that, like I got in the shower, washed my hair, everything. I was able to really do things, but like lifting things or anything like that, took me like a few days, but the majority of things I can really actually do. Actually I'm really happy. I was, like I said, I did a lot of research, but I wasn't really sure of what I was getting into. And when I first did it, I was like, oh I'm going too big, like the biggest I could go. I'm like that's too big, but they actually turned out really good. They feel real. They look real. Like I'm super satisfied with what I chose and the advice that was given to me to actually make a decision of what I wanted. 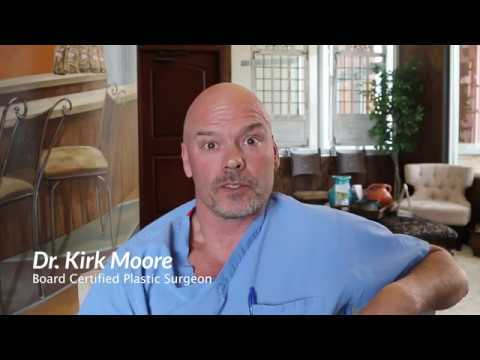 I would definitely recommend Dr. Kirk Moore. He actually knows what he's doing. And that's one thing that you want with a doctor, is have confidence in what they're doing. Let's you know, hey, no you're not going to do this. This isn't going to happen. We're going to do it like this because in your mind, you're totally thinking of something different. So it's always good to actually get the doctor who sees this every day, like actually give you advice for it so I would definitely recommend him.